I'll admit that I'm not the type to watch American Idol. It's just not my bag. Maybe the greatness of LOST [insert mandatory moment of silence] has turned me off to all other TV shows, I don't know. But anyone who watches even five minutes of American Idol or any of the other talent-reality genre shows can easily see that showing off your voice is "in" right now…even if you have no voice to show off. Whether you are a "William Hung" or a "Kelly Clarkson", one new app in the App Store is hoping to help you find your voice and show it off well. Voice Tutor, which is currently in Apple's "Featured" section of the App Store, claims that "no matter what kind of voice you have, or how long you've been singing, we can help". Does it live up? I took it for a spin to see. Upon firing up Voice Tutor, you are immediately presented with a diagnostic to walk you through a series of scales to help diagnose the type of singer you are. Voice Tutor walks you through a series of scales then allows you to self-diagnose based on comparative audio examples and subsequently places you into one of four categories: Tension, Breathiness, Cracking or Connected. In case any of you are interested, my voice is "Cracked", since my voice somewhat awkwardly flips into falsetto as I move into higher ranges. But based on the type of singer you are, Voice Tutor then presents you with an entire series of vocal exercises specifically tailored to your vocal type. Once you've completed the diagnostic, Voice Tutor has four main features: • How to Sing: This section gives a brief text overview of the goal of vocal instruction. • Focus On My Voice: This section includes the exercises I mentioned previously that are tailored to your vocal type. You simply tap your voice type and your vocal lesson begins. 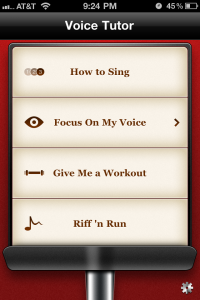 • Give Me a Workout: This section is perfect for vocal warmups before sound checks, auditions, performances and the like. Just tap this and Voice Tutor runs you through a roughly 10-minute vocal warmup to get your voice loose and relaxed before a gig. 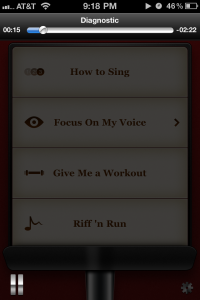 • Riff n' Run: This is a section for advanced vocalists and focusses less on raw technique and more on vocal style by walking you through a series of vocal riffs and scale runs. It's clearly intended to walk you through developing a vocal technique or "fingerprint" for your voice. Voice Tutor, simply put, is about as close as you can get to carrying a professional vocal coach around in your pocket. It's like P90X for your larynx. Voice Tutor was developed by professional vocal coaches who have trained the likes of Justin Timberlake and Jennifer Hudson as well as up and coming bands like One Call and Audio, not to mention many others. So there's real science and know-how behind the brains of this app…it wasn't made by a clueless non-musical developer renting out his parents basement. The voice teachers that made this app are trained professionals with years of experience teaching some of the greatest voices in pop music. Voice Tutor contains many of the exact exercises and coaching that a live vocal coach would walk you through at a cost of around $50-$75 for a half hour lesson. The exercises are thorough and consist of some brief recorded vocal coaching from a real vocal coach, followed by a series of scales played on a piano. The idea is that you follow the teacher's instruction by singing along with the piano, just as you would in a real voice lesson. Voice Tutor walks you through each lesson following this basic premise. I ran through the entire lesson for my poor cracking voice and it took over an hour and a half, but the lessons in Voice Tutor can easily be digested in bits and pieces. Users can easily pause the lesson or skip to the previous/next lesson, or scrub through the current lesson to get to another part of it. The UI is straightforward and simple, but well-designed from a logical standpoint, and the graphics are very clean and well-done. Voice Tutor's main in-app disclaimer is perhaps a bit obvious: the app can never completely replace a trained vocal professional who is able to sit beside you and give you active feedback on your singing. So no, Voice Tutor is not a substitution for expensive voice lessons, but I have to say, it could come dangerously close to it, depending on what your needs are. 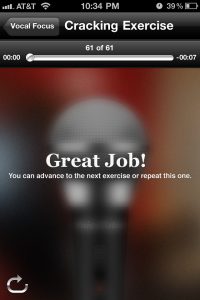 Beginners will benefit by walking through Voice Tutor's exercises and getting a feel for how "off-pace" they may be. Experienced singers will benefit by having a regular vocal warm-up tool as well as something that can help them hone their personal vocal style. And I should mention in fairness that I have seen a few of the reviews in iTunes and some of them mention that Voice Tutor is just a bunch of audio tracks, to which I reply "…and your point is?" If you want to sing and play Angry Birds, by all means, please do that. 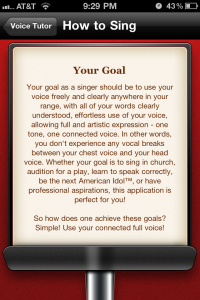 But if you want a professional quality tool to help you diagnose where you are as a singer and then move you forward and give you great practice, Voice Tutor is a perfect app for that. For the record, even though Voice Tutor has a nice UI and graphics, the fact that the "meat" of the app is primarily auditory means that you can easily practice your voice in the car, on the commute to work, in the shower, etc. My wife and even I used it in the car on the way to a vocal gig we did this weekend. After all, the very nature of music is auditory, not visual. I think Stevie Wonder and others would agree. 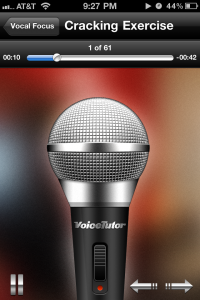 All in all, Voice Tutor is one of the rarer apps in the App Store that actually executes well on a niche concept. True, Voice Tutor will not be for everyone, but in the musical circles I run in here in Atlanta, many of my friends who are professional musicians and vocalists have begun to rely on Voice Tutor for pre-gig vocal warmups and general vocal practice. In fact, I know a few professional vocal coaches who have begun to assign Voice Tutor to their students so that the students can supplement the instruction they receive in their expensive vocal lessons as they go through the week at home, school, etc. Lastly, if you take your singing seriously enough to want to improve on it, Voice Tutor's $5 price tag should certainly not be a deterrent. And who knows, if your singing is bad enough, you may just find someone who will buy Voice Tutor for you just to preserve their own sanity! If any of you have experience using Voice Tutor or if this review persuades you one way or the other, let us know in the comments!